The first iteration showed up in Paris at Harry's New York Bar in the 1920s. This combination of vodka and canned tomato juice was known as a "Bucket of Blood." When the drink was brought to the St. Regis Hotel in New York around 1933, it was lauded as a hangover cure and called the "Red Snapper" (you can still belly up to the bar there and order an original Red Snapper). It's not certain when bars started calling the drink "Bloody Mary," a reference to Queen Mary I of England and Ireland, who took it as her personal mission to rid the country of Protestants, but recipes for drinks named "Bloody Mary" can be found in print starting in 1946. These days, anyone can enjoy a Bloody Mary for breakfast, lunch or whenever the mood strikes. While the original recipe is fairly simple (vodka, tomato juice, lemon juice, salt, pepper, cayenne pepper and Worcestershire sauce), bartenders and restaurants alike have taken the drink and made it their own, spicing it up with Sriracha or adding enough garnish to make the Bloody a meal in and of itself. Perhaps one of the most refreshing places to enjoy a Bloody Mary is at a ski resort. 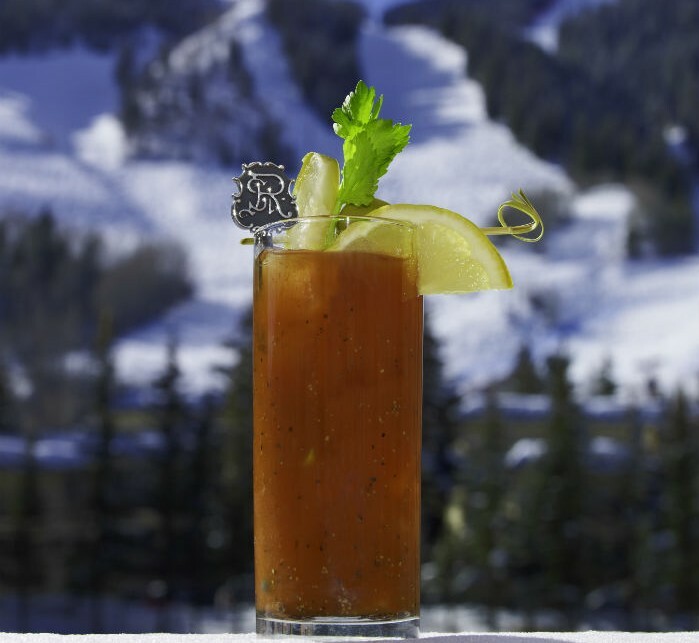 There's something about the combination of spice and veggie, cut with smooth and (sometimes flavored) vodka, which makes it a perfect beverage for a mid-morning ski break-especially if you partied a bit too hardy the night before. However, the restorative powers of the snack-bar selection of garnish are equally as pleasurable at après. Here are some of the most interesting--and tasty--Bloody Marys that are popping up at ski resorts around the country. Be prepared to say "Ciao, bella!" to this Italian-inspired Bloody Mary when it arrives at your table at Il Villaggio Osteria at the base of Jackson Hole Resort. This version features inspires "La Dolce Vita" with a large selection of Italian style foods as garnish, from skewers of charcuterie to pickled vegetables, house-made meatballs and a mini caprese salad. View Jackson Hole Resort lift tickets. Not content with just one Bloody Mary option, the Market Café at Timberline Ski Resort in Mount Hood, Oregon, offers six signature Bloody Marys, plus a build-your-own Bloody Mary menu which includes choices of five flavors and five infusions (with limited edition infusions that change each season), plus a "food bloody" on Sundays, which is themed for sports and holidays and features garnishes of everything from shrimp to sliders. If you're too overwhelmed with the selection or suffer from an inability to make a decision, order a flight and enjoy three mini Bloody Marys of your choice. 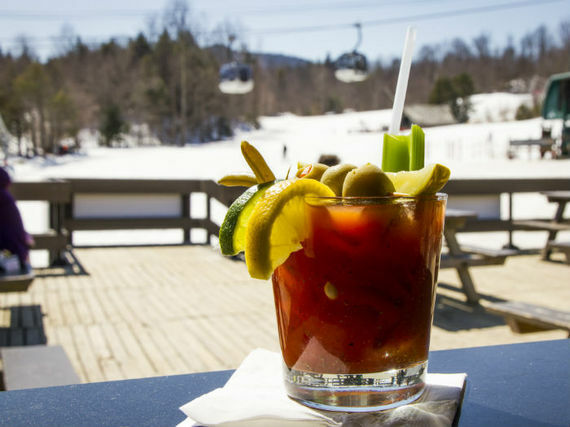 For those who claim that they don't like Bloody Marys, head to Whiteface Mountain in New York. Perhaps it's the splash of pickle juice that makes this version so tasty; maybe it's the homemade spicy Dilly Beans. Whatever it is, this version is lauded by guests and locals as one of the best on the planet. Which is good, because there's a bar on Jupiter that claims to have the best in the solar system. View Whiteface Mountain lift tickets. Too tame for you? 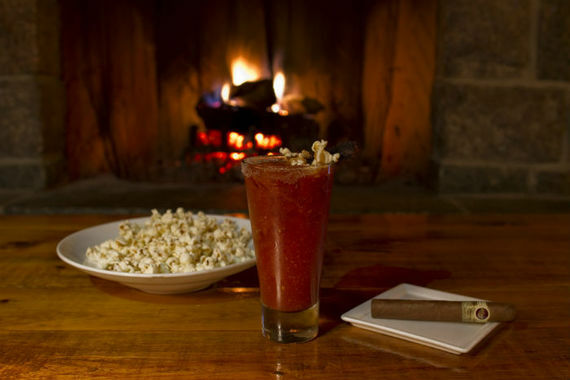 Walk on the wild side and head to KANU Lounge at Whiteface Lodge in Lake Placid for a more "manly" version. The "My Deer Bloody" puts a Bambi-spin on the classic cocktail, incorporating teriyaki venison jerky-infused Jack Daniels, truffle salt on the rim, and truffle pop corn a venison stick as garnish. Good things come in jars: peanut butter, moonshine and those cute hot chocolate mix things that you get for Christmas. However, one of the best things that comes in a jar is the Signature Bloody Mary at Rocker@Squaw. Made with Hanger One Chipotle Vodka, house-made spicy Bloody Mary mix, floated with Guinness (!) and served in a glass mason jar with all the fixing (think: bacon, celery, cherry tomatoes, blue cheese, lemon wedges and a peppered rim), this Signature Bloody Mary is perfect for sipping mountainside under the Sierra sun--no banjos required. View Squaw Valley lift tickets. Remember how the first Bloody Mary was served at the St. Regis in New York? They're still at it. The Bloody Mary remains the signature cocktail of the St. Regis brand, but each St. Regis hotel crafts its own interpretation of the libation. At the St. Regis Aspen Resort, the "Downhill Snapper" is served, an herbaceous concoction with dill and basil mixed with local vodka from Woody Creek Distillers. View Aspen Snowmass lift tickets. At the St. Regis Deer Valley, the "7452 Mary," (a nod to the resort's altitude) is a blend of oat-distilled Vodka 7000 from local High West Distillery and a regional salt rim garnished with a Wasabi-Celery foam. View Deer Valley lift tickets. Few Bloody Marys have as rabid a fan base as ABasin's. 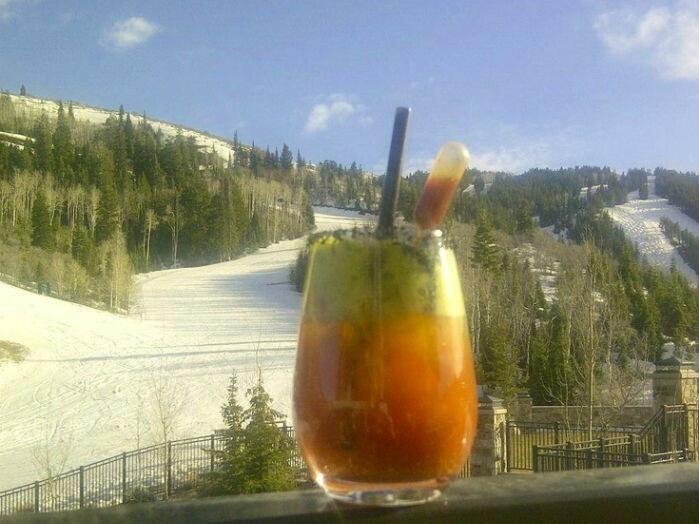 Whether it's the fact that you can order one before or after skiing well into spring (the Basin has been known to stay open until July 4 in some years), or simply the plethora of pig in this drink, the fans are vocal about their love of the Bloody that's offered at the 6th Alley Bar. 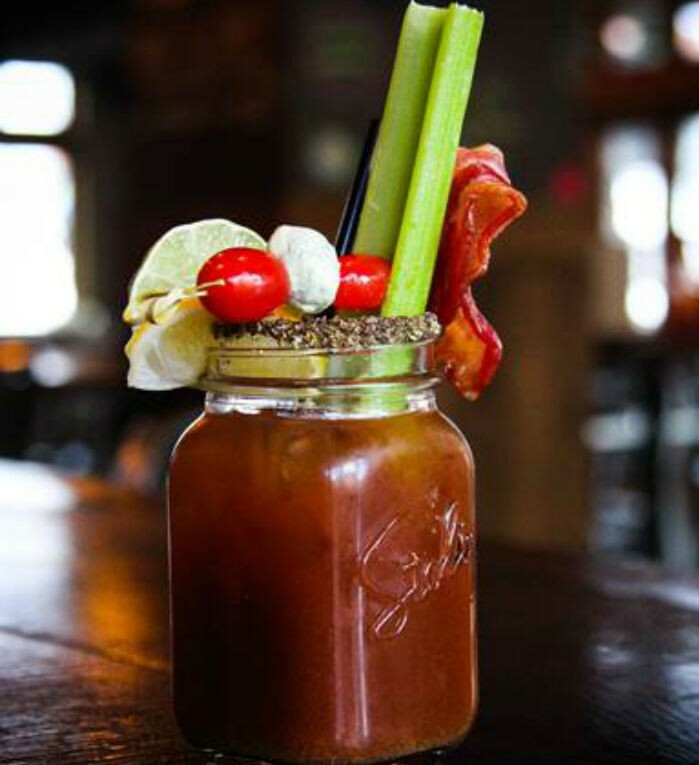 Bacon infused vodka is mixed with secret ingredients and topped with a bacon garnish in this concoction that has been named the "Best Bloody Mary in Summit County, Colorado." 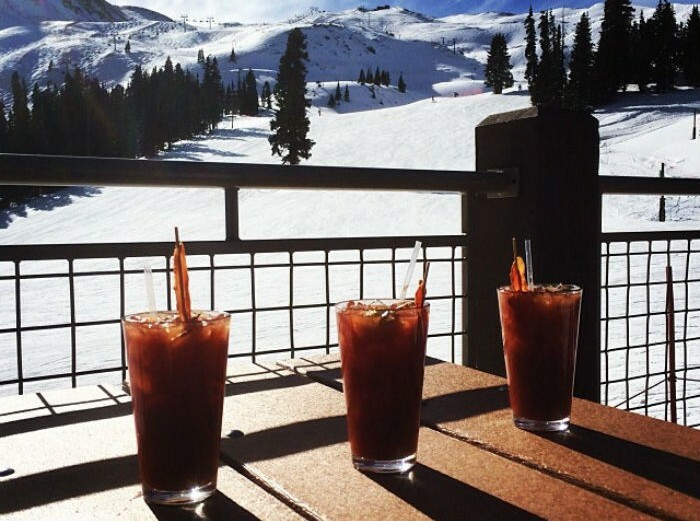 To further reinforce the fact that this Bloody is perfect on a ski day, Arapahoe Basin even has a lift ticket deal that includes a voucher for the famous Bacon Bloody Mary. All hail the Queen. View Arapahoe Basin lift tickets. 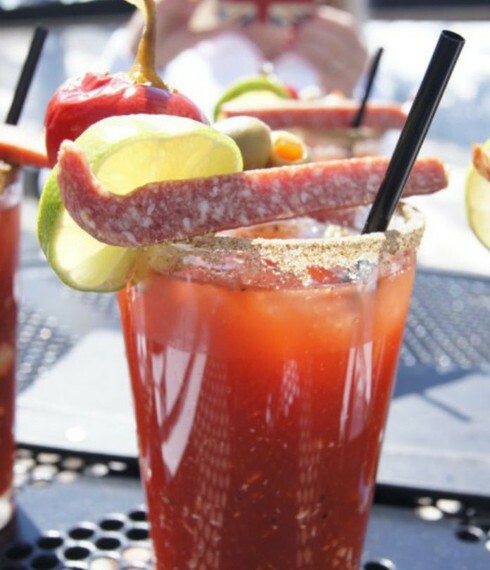 Those crazy Canadians are always starting something, including renaming the Bloody Mary after another (not-by-his-choice) bloody ruler: Caesar. The Bloody Caesar appeared in 1969 in Calgary, Alberta and is the national drink of Canada. 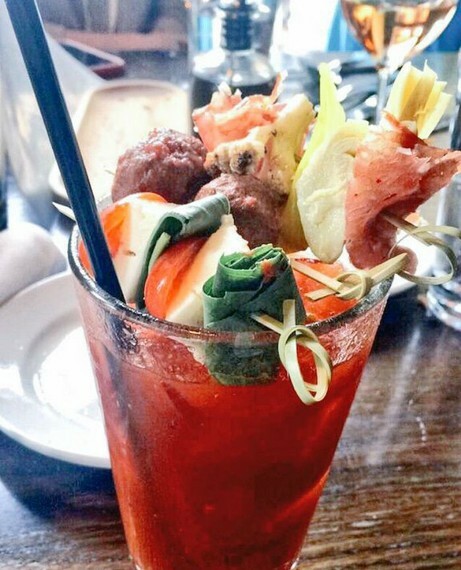 Made with Clamato instead of straight tomato juice, the Caesar is follows the rest of the ingredients pretty closely, including a laundry list of garnishes like olives, lemon, lime, pickled gherkins (those little mini pickles), pickled green beans, mini pickled onions and bacon. 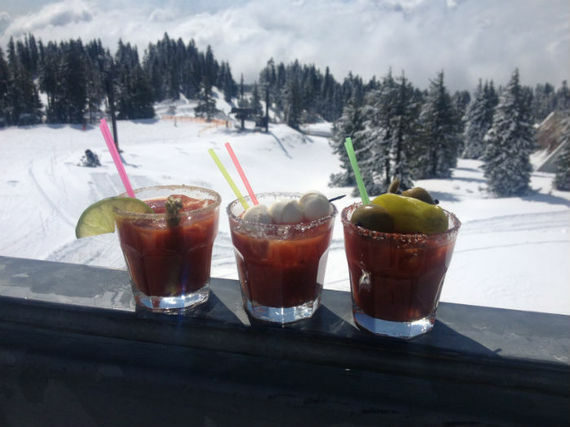 However, locals tell us that this 'meal in a mug' is saltier and more drinkable than a regular Bloody Mary making it the best choice for an après, avant or in-between ski-day drink. We recommend you try it at the Garibaldi Lift Company (GLC) at Whistler Blackcomb. View Whistler Blackcomb lift tickets.